Regaining Perspective – It Works For Bobbi! Published on May 10, 2009 August 9, 2016 by Bobbi-Jo G.
I have often looked at each of my four daughters and been shocked at how much of me I see so often manifest in the things they say, the expressions they wear, and in the things they do. Most of the time I feel a great sense of joy and fulfillment when I see those bits of me, however there are also those haunting moments when I hear my own negative words coming out of them, or seeing my own bad habits surfacing in them. This mother’s day, I have taken some time to think about each of my girls, the blessings that they are in my life, and kind of have a “time out” moment where my thoughts drift to more eternal things. Over this weekend, and especially due to a marvelous Stake Relief Society Conference I attended, I was reminded that when I’m most often feeling sad, or desperate – it’s because somehow I’ve managed to lose my perspective among the hustle and bustle that is life. I know that may not be the cause of grief for all of us, but for me – it is. I am most often feeling low when I lose sight of my true purpose here, and when I lose track of what I’m supposed to be finding joy IN. Isn’t that easy to do when you’re up to your elbows in dirty diapers, dirty dishes, and dirty floors? I catch myself sitting in the middle of the floor, searching for the ‘why’ in all of this! THIS is supposed to be joy? But, it’s funny, just at those moments, I’m often gently reminded that yes, motherhood, being a wife, homemaking – this is the path to supreme and lasting happiness. Absolutely. If I’m not feeling that – then I’ve managed to lose that precious eternal perspective. I love being a mother. I love it. Do I rejoice it in every.single.minute? No. I think I might be a little off my rocker if I didn’t have moments of grief, anger, exasperation, and boredom. That’s what makes me human! But, what makes me divine, is that I do it anyway. 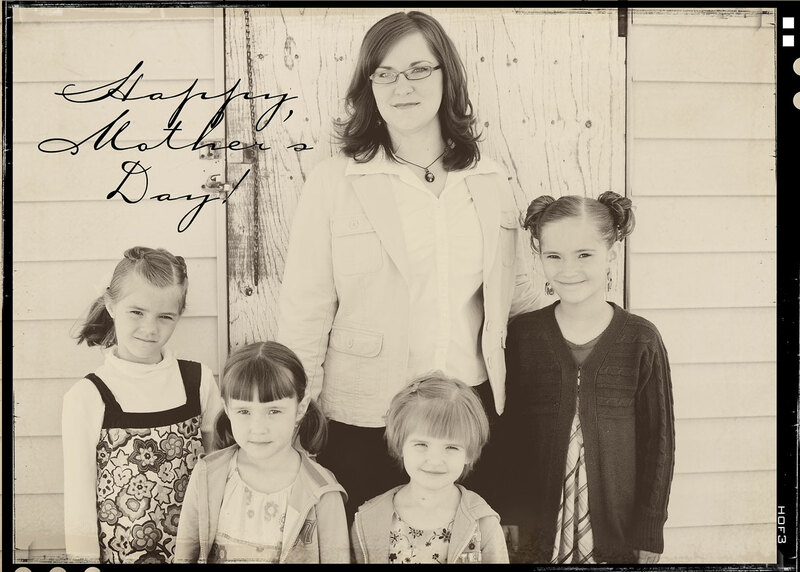 So, on this mother’s day – I want to renew my quest for finding joy in motherhood. Joy in all of the little things that pass so quickly, and that I will miss some day. I want to remember to forget my fears – leave those in the hands of the Lord, who is mighty to save, and raise my family on my hopes and dreams for them. I recommit to making my home one of love, peace, laughter, and gospel teaching. I look at the sweet angel faces of my girls and remember that this is what is eternal. The feelings of compassion that well within me are a gift that will help make me a good mother. Perfect mother? No such thing. At least I haven’t come across one on this earth. But, good mother? I think I can try that. It’s part of our nature as women to nurture and love, create and build up. I love being reminded of that – especially on Mother’s Day. So, hug your kiddos, grandkids, neighbor kids (okay, maybe ask before you go hugging other people’s kids – he he) and share the love that is in you! It’s wonderful! And have a wonderful Mother’s Day! Beautiful picture of you and your girls! this was so reflective. oddly, i find myself at the same point in life right now. making more of an effort to embrace it all, and see past the insanity to embrace the joy. it’s so worth it. Amen Bobbi! This “time” with the girls will be gone before you know it. It happens faster than anyone could ever try and explain. So I won’t even try. All I have left is the home movies. And those are SO fun to watch!! Anyway. Loved the post! I can relate SO much! HAPPY MOTHER’S DAY!! Thanks for the reminder of the eternal perspective. I think you are a wonderful mother and those 4 girls are truly lucky. you say it so beautifully and that picture- GORGEOUS. I love that quotation. It says so much. You, and those girls of yours, are so gorgeous.